Towpath astronomer Brian Jones pinpoints one of the oldest star groups. 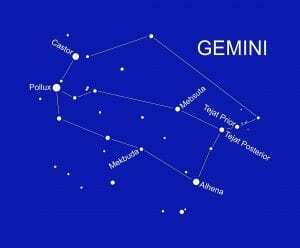 VISIBLE high in the southern sky during mid-evenings in February, the constellation of Gemini is one of the oldest star groups in the heavens and as long ago as the second millennium BC, Babylonian astronomers were depicting this group in their star maps. Both Castor and Pollux are unmistakeable and you should have no trouble identifying them. Located at a distance of around 50 light years, Castor is actually a binary star system, being formed from two stars which are orbiting each other once every 400 years or so. A third member of this group has also been discovered, this being a faint red dwarf star which orbits the main pair. What makes Castor really interesting is that each of these three stars is actually a binary star in its own right. Although you would need a large telescope to resolve the three main individual stars forming the Castor system, you can at least turn your gaze towards Castor and appreciate the fact that you are actually looking at a fairly complicated sextuple stellar family! Lying just to the south of Castor is Pollux. This is the brightest star in Gemini, the light from which has taken around 35 years to reach our planet. Pollux has a conspicuous yellow-orange tint which is easily picked out in binoculars and which contrasts well with the whiteness of nearby Castor. The third brightest star in Gemini is Alhena which lies at a distance of just over 100 light years and is believed to derive its name from the Arabic for ‘The Mark on the Neck of a Camel’. Castor, Pollux and Alhena are all relatively close to us, in total contrast to Mebsuta and Mekbuda which shine from distances of around 850 light years and 1200 light years respectively. The unusually named Tejat Prior and Tejat Posterior are both red giant stars, the most distant of which is Tejat Prior, the light from this star having taken around 350 years to reach us. Lying at a distance of 230 light years, Tejat Posterior is somewhat closer, the light we are seeing from this star having set off towards us during the reign of George III. 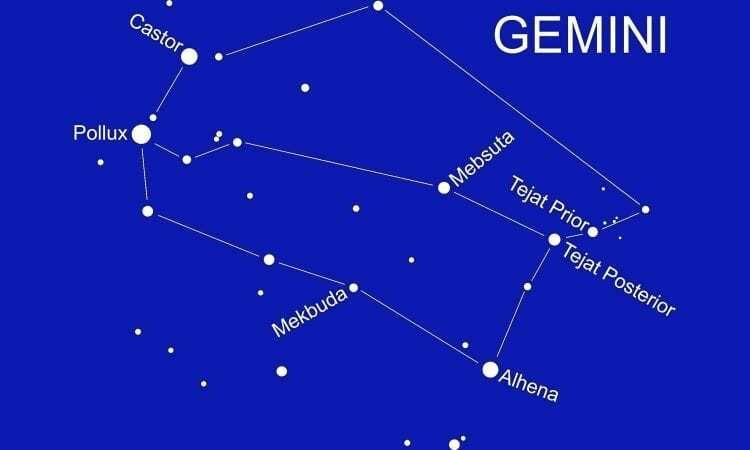 The western region of Gemini, including the three stars Alhena, Tejat Prior and Tejat Posterior, straddles the Milky Way, and if the night is dark, clear and moonless, this area of sky is well worth sweeping with binoculars, which will reveal many pretty star fields. Our celestial target for the next Towpath Astronomer article will be the prominent constellation of Leo which represents the lion that Hercules slew as the first of his 12 labours and which can be found prowling the spring night skies. 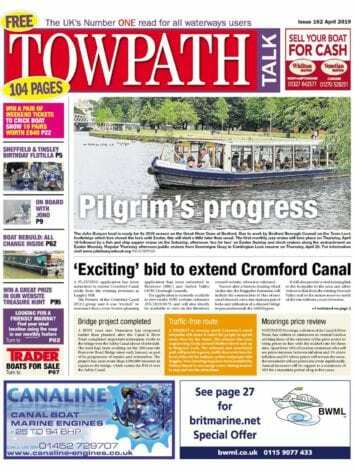 In the meantime, now that warmer evenings are on the way, why not venture out on to the towpath under the late-winter skies and check out the stars of Gemini? Expressing distances to the stars and other objects in the sky in miles would involve using numbers that are so huge they would be unwieldy. To combat this, astronomers use the term ‘light year’ as a unit of distance. To put it simply, a light year is the distance a beam of light, travelling at around 186,000 miles (300,000km) per second, would travel in a year, and is equivalent to 5.88 trillion miles (9.46 trillion kilometres).